Find a range of products including electricals, appliances, toys and clothing from catalogue based department store Argos, one of the most well known UK retailers. Free delivery available on selected products with big savings on furniture, homeware and technology plus regular 10% off vouchers with a minimum spend of up to £100. Shop Great Deals on all Moon And Back branded Jewelleryitems – gifts for him and her with a 25% discount. The Argos website is relatively easy to use. You can use the search bar at the top of the site to search by the item number and you can also search to try and find the keyword for the item you need as well. The site has plenty of categories for you to choose from and they have everything that ranges from garden furniture to games and you can also sort it via various search options. You can search it by price low to high, by online exclusives and so much more so you know you won’t have any problems there. Sometimes Argos have a discount that gives you £5 off when you spend £50 or more and they can even offer you £10 off when you spend £100 or more as well but this discount is only available at certain times of the year so this is something that you will want to keep in mind. With Argos, it is possible to get delivery on the very same day and when you do this, you know you can get everything you need without even having to leave the house. The items you can get delivered from the site will come to an address of your choosing and when you do get them delivered you will need to order them before a certain time. For example, if you order before 10am you can get your product delivered before 2pm. With so many options available, you know you can get everything you need from Argos and it is a great way for you to make sure that you get the products you need and at a price you can afford. Why don’t you contact Argos today to see how they could help you, or take a look at their site to see if they have something that you need. Argos was first established by Richard Tompkins the founder of the Green Shield Stamp Empire in the UK. If you remember collecting Green Shield stamps with a purchase allowed you to select a promotional gift from a selection of products in a catalogue instead of offering a discount off the price. Well Richard thought he could expand this concept selling the goods in the same way from a catalogue. The original Green Shield Stamp shops were rebranded with the first store opening its doors in Canterbury in 1973. Argos was first founded with 1000 employees and found itself an instant success taking up to £1 million pounds in a week running up to Christmas. In 1979 they were purchased by BAT Industries for £32 million, cementing its reputation as a major UK retailer. Argos is now the first choice retailer for general goods on the high street with almost all households have a catalogue on hand containing all the available products. They sell general products for the home and garden including furniture, toys and electrical goods having over 700 stores throughout the UK and Republic of Ireland. They also operates online from Argos.co.uk and over the telephone. They currently have sales of over £4.3 billion and employ 33000 staff, a large increase from the original 1000 in 1973. What if the voucher code doesn’t work? In the rare event that a voucher code does not give the expected discount or will not work at all do get in touch with our team who will look into the issues and try and help. To get in touch with us simply use the feedback form on the ‘contact us’ page and we will get on it right away. Alternatively you can use the ‘report a coupon’ link located below the voucher code listing. Ready to use a Argos voucher code? Follow these 9 simple steps to start saving. Add you products to the shopping basket in the normal way. Select the code you need from the Argos promotional page. Click on the ‘reveal coupon code’ button. Click ‘copy’ on the pop up light-box to copy the voucher to the clipboard. The Argos.co.ukÂ store will open automatically. On the basket page you will normally find a box to enter the code below the product description. 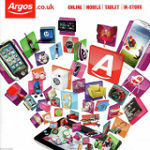 Paste your Argos voucher code into this box and click apply. The discount should have been redeemed against the order value. Occasionally you may have to enter the voucher at the checkout payment summary rather than the basket. Well done! you have just made a real saving, just pay for your order as normal on the Argos store.